Eric Schmidt was called to the witness stand Tuesday in Oracle’s copyright infringement lawsuit against Google, and he gave little ground during some tense exchanges with Oracle’s attorney. The chairman of Alphabet, Google’s parent company, was the first witness called in the trial, in which Oracle accuses Google of infringing its Java copyrights in Android. Schmidt was initially questioned by Google's own attorney, and he testified that Google did not believe it needed a license to use 37 Java application programming interfaces for which Oracle owns the copyright. Asked for the basis of that belief, he replied: “Forty years of experience,” implying it was accepted practice in the software industry that APIs can be used without permission. The mood was more tense when Oracle attorney Peter Bicks began his cross-examination of Schmidt, but the Alphabet chairman kept his cool. Bicks wanted to show the jury that Google requires a license for the use of its own APIs, and that it considers its intellectual property a highly valuable asset. “Are you telling me that you don’t treat your APIs as proprietary?” Bicks asked Schmidt at one point. Google has "millions of APIs,” Schmidt replied, and asked for a specific example. “I’m not aware of one that we treat as proprietary in the way you’re asking your question,” Schmidt said later. At another point, as Bicks tried to get Schmidt to acknowledge that Google was in a hurry to get Android to market, Schmidt contested that the iPhone was a competitor to its mobile OS. “You knew the iPhone was a competing product to Android, didn't you?” Bicks asked. He finally acknowleged that Google was under "strategic pressure" to get its OS to market. At another point, Schmidt said he didn’t recognize the name Henrique de Castro, a well known executive who ran Google’s mobile platforms division while Schmidt was CEO. When Schmidt finally recognized the name, he said Bicks had been pronouncing it incorrectly. His responses made it more difficult for Bicks to establish points he wanted to make to the jury. But it also meant that Bicks wasn’t finished with his questioning when court wrapped for the day at 1 pm. That means Schmidt will back in court at 7:30 am Wednesday to finish up. Google attorney Bob Van Nest protested that Oracle was almost done with Schmidt but Judge William Alsup said the jury had a right to finish on time. “I know this witness is a busy man, and so is the jury, and right now the jury’s convenience counts for a lot more,” Alsup said. Schmidt’s testimony wrapped up a day that began with opening statements from lawyers on each side. It was their chance to lay out their case for the jury, and each side was given one hour. Bicks, the Oracle attorney, went first, and tried to appeal to the jury’s sense of right and wrong. “They broke a very basic rule, a rule we’ve all known since we were this high — you don’t take someone else’s property and use it for your own benefit,” he said. 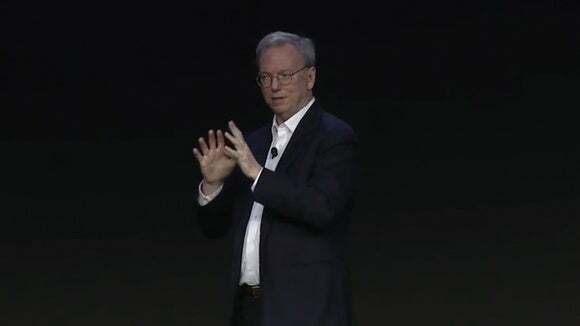 Emphasizing the scale of Google’s actions, Bicks said 100,000 Android smartphones would be activated by the end of his remarks. Since 2008, he said, 3 billion Android devices have been activated, netting Google $42 billion in revenue and $21 billion in profit. Google will say that it used just 11,000 lines of code, Bicks told the jury, but he maintained that 11,000 lines is a lot. “It took 10,000 lines of code to power this Apollo lunar module,” he said, showing a picture of the craft to drive home his point. Google’s attorney had a different view. He portrayed Google as an innovative company that worked hard to build a brand new OS that was unlike anything before it. “These APIs that they’re complaining about represent less than one-tenth of 1 percent of what’s in Android,” Van Nest told the jury. Google’s use of the APIs was “transformative,” he said, touching on one of the key factors in determining fair use under copyright law. “If it adds something new, with a different purpose or a different character - even if it’s commercial - it can be fair use,” Van Nest told the jury. “Android is exactly the kind of transformative use that ‘fair use’ was intended to protect and encourage,” he said. The trial is expected to last four weeks and Oracle is seeking $8.8 billion in damages. Google denies any wrongdoing and says Oracle should get nothing.